Margie Gomez shows off a red-tailed hawk. 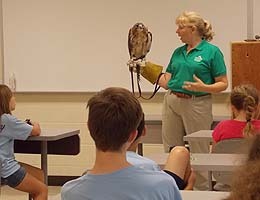 Where else can you spend the week dissecting an owl pellet, interacting with a live opossum and investigating animal tracks but this year’s Camp Osprey, held for youngsters at the Chesapeake Campus of Tidewater Community College in August? Campers also learned to use binoculars, dissect a feather, use microscopes for lab experiments and study wetlands and conservation with biology Professor Lisa Behm. Summer campers explored the outdoors on Chesapeake’s “green” campus, hiking through swamps and a variety of nature trails on the grounds. “Our goal is to give young people the opportunity to spend time with nature, as they are our future,” said Behm, who organizes the camps. “I love this camp, because it’s mostly about science and that’s my favorite subject,” said Ethan, a Camp Osprey camper for the last four years. Campers also learned about nature through guest presenters, including volunteer educators Margie Gomez and Amanda Cox with the Virginia Zoo in Norfolk. The duo conducted a lively presentation, complete with live animals, including a bullfrog, opossum, red-tailed hawk and Eastern screech owl. All featured animals are indigenous to the area. “It’s great to help kids learn about the environment and living things. That’s why I keep coming back,” said Alena Cooper, a TCC alum and camp helper for five years. Cooper recently graduated from Old Dominion University with plans to pursue a career in conservation education.